Marc Marquez produced the fastest ever MotoGP lap of the Sepang track in Malaysia today to claim a Repsol Honda 1-2 at the conclusion of the opening pre-season test of 2015. In cool conditions for the first hour of today’s eight-hour session, the track resembled a frenetic qualifying session as most of the field went in search of a hot lap on soft rubber and low fuel loads. But it was Marquez that delivered a sensational performance when he clocked a breath-taking best of 1.58.867 on his eighth lap. That obliterated his own official lap record of 2.01.150 he set on his way to winning the Malaysian GP last October. At the time that put him almost a second clear of the field and at the end of the day only Repsol Honda teammate Dani Pedrosa had slashed his huge advantage to less than 0.5s. Pedrosa had an equally impressive day on the new 2015 factory RC213V. He set a brilliant time of 1.59.006 to finish just 0.139s behind Marquez. But he caught the eye with a fast and consistent full 20-lap race simulation. His first 10 laps of the distance run were in the 2.00 bracket, and not even Marquez could match that blistering speed. Marquez though did his race simulation at a hotter part of the day when the heat and humidity would have meant he’d have less grip than when Pedrosa did his run. Andrea Iannone completed the top three with a best lap of 1.59.388 that put the Italian ahead factory Yamaha duo Valentino Rossi and Jorge Lorenzo. Rossi was fourth with personal best time of 1.59.401 having cured some chatter issues that hampered him yesterday. Rossi ran a new swingarm and tried experimental engine braking and traction control settings in his race simulation. He lost key time in two laps when changing maps and aborted the run after 16-laps. 2.01 barrier, but issues stopping his new YZR-M1 meant he couldn’t maintain a pace to match Pedrosa. 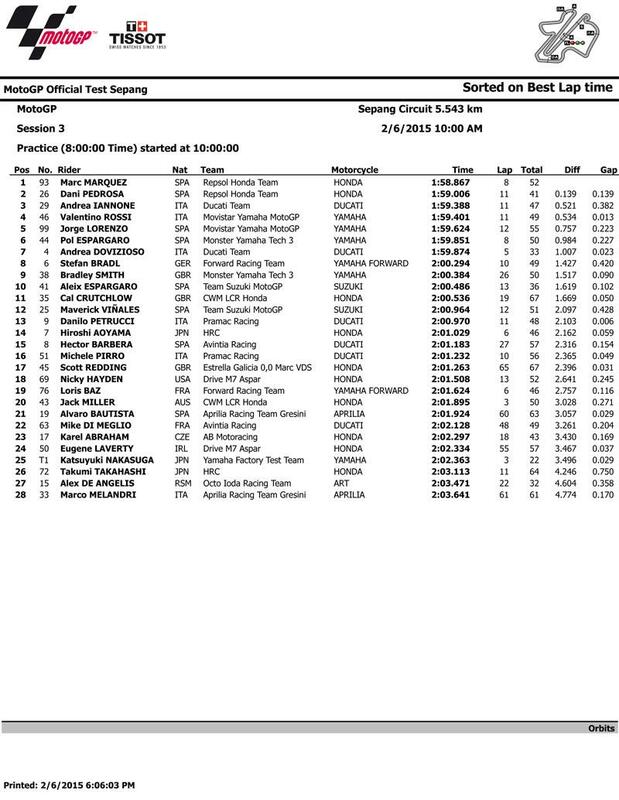 Pol Espargaro completed the top six, with Stefan Bradl again impressing on the Forward Yamaha Open class YZR-M1. The German was eighth quickest with a best lap of 2.00.294. Bradley Smith was one place further back in ninth and he just edged out factory Suzuki rider Aleix Espargaro and compatriot Cal Crutchlow. The former World Supersport champion was in 11th and once again struggling to improve his speed on fresh rubber on the CWM LCR Honda. Crutchlow used to be the master of throwing in a fast lap on new tyres at Yamaha, but he struggled to do the same in a tough season for Ducati in 2014. 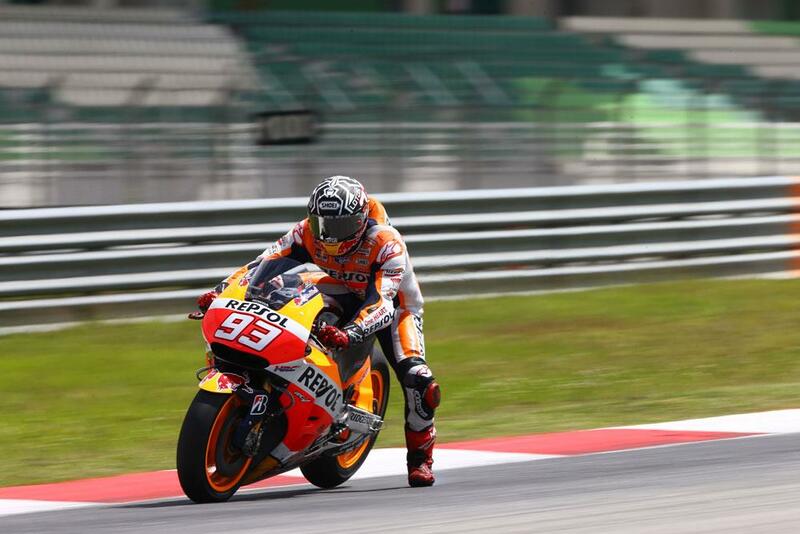 And it was the issue today, though encouragingly he is close and competitive to Marquez and Pedrosa on used tyres. Scott Redding found himself down in 17th on the Estrella Galicia Marc VDS Honda. The 22-year-old has been steadily getting to grips with the factory Honda RC213V he will race in 2015 and there is plenty of work to be done after his best time of 2.01.263 left him 2.3s off the best pace set by Marquez. Eugene Laverty’s debut on the new Honda RC213V-RS Open bike ended with him in 24th position. Marco Melandri’s nightmare return to MotoGP with Aprilia continued today when he was left languishing down in 28th. His best lap of 2.03.641 was 4.7s off the best pace and 1.7s behind teammate Alvaro Bautista, who finished 21st.